Building indoor ski slopes in locations like sun-scorched Dubai epitomizes energy profligacy for some people. But there is still plenty of interest in bringing winter sports to warmer parts of the world to tap demand from skaters and skiers, and to raise the sporting profile of cities and regions. Now architects working with a Dutch company say they have found a way to build an indoor ski facility in balmy Barcelona — but with a difference. The facility would rely on recycled cooling that otherwise goes to waste in the city’s harbor on the Mediterranean Sea. The harbor project is part of a suite of initiatives aimed at transforming south Barcelona into a green power showcase, partly by using waste in innovative ways. One facility already burns plant trimmings and other natural waste from the city’s parks and gardens to generate greener electricity. That facility should eventually generate heating, too. One of the next stages is to take advantage of a byproduct of large amounts of liquefied natural gas, or L.N.G., that is shipped to the city’s shoreline at temperatures of about minus 150 degrees Celsius (minus 238 Fahrenheit). The idea is to capture and reuse the cold that is released when the liquid is returned to a gaseous state. Construction could begin in 2015, or as soon as Ecoenergies Barcelona Sud, a company created by the city authorities, and by Dalkia, a unit of the French engineering giant Veolia and Electricité de France, signs up enough clients that are seeking sources of cooling. Eventually the biomass and harbor facilities would be integrated into a district heating and cooling network, including energy generated from solar sources. That system should reduce the city’s electricity consumption 1 percent in the next eight years, said Delphine Labeyrie, a spokeswoman for Ecoenergies Barcelona Sud. Recycling thermal energy often involves recovering waste heat rather than waste cold, and the initiative to recover cooling from the L.N.G. industry may make the project in Barcelona the first of its kind, Ms. Labeyrie said. The municipal authorities first identified the opportunity in the harbor, where the natural gas industry runs comparatively warm seawater over pipes containing the L.N.G. to raise its temperature and return it to a gaseous state. The process cools the seawater, but the energy is dissipated into the sea. Ecoenergies Barcelona Sud would capture the cooling by running pipes filled with a thermal liquid similar to antifreeze near the L.N.G. pipes. The thermal liquid would absorb the cooling and convey it through a series of linked circuits to a nearby facility, where it would be stored as ice. Clients could tap that cold store for air-conditioning and other industrial processes — and, possibly, for applications like year-round winter sports. That is the hope of B01 Arquitectes, a firm in Barcelona that promotes sustainable building. Three years ago, when the architects heard that a Dutch company called SnowWorld, which builds indoor ski facilities, was looking for a site in Barcelona, they pitched the idea of using the harbor project as an eco-friendly way of producing ice and snow. “It is already a difficult thing in Holland, both from the economic and ecological point of view, to maintain a hall at minus 6 degrees Celsius all year, so you can imagine that in the climate of Barcelona how much bigger a challenge that becomes,” said Sander Laudy, the architect at B01 who devised the project. For SnowWorld, which already operates two large indoor ski facilities in the Netherlands, the project would be the most significant step it has taken to improve the environmental credentials of indoor skiing. SnowWorld already reduces its energy use by recovering heat from snowmaking equipment at one of its sites, in Landgraaf. The heat is then recycled for water and for use in radiators at a nearby restaurant and hotel. The company also buys power from utilities that supply electricity from sources like wind. 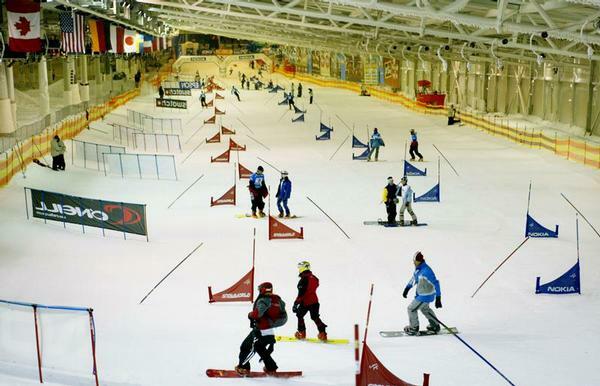 Ski Dubai, operated by Majid Al Futtaim Properties, has also sought to save energy with efficient cooling and insulation — as in walls that are 5 meters, or 16.4 feet, thick — and by recycling snow and using meltwater for air-conditioning, according to its Web site. But the facility in Barcelona would be considered “carbon-neutral” because the harbor would provide the cooling, while solar panels would offset the electricity used for lighting and needed to run the machinery, said Wim Moerman, the chief financial officer for SnowWorld. He said the facility in Barcelona would cost about €40 million, or $55 million, to build, or about the same as a similar one in the Netherlands. It would also cost about the same to operate, despite the higher temperatures in Spain. Barcelona still has to make a formal application to the Spanish authorities to be in the running to be host to the Games. But any forthcoming bid would rely heavily on the environmental credentials of facilities located in Barcelona and in the nearby Pyrenees, said Vicente Guallart, the city’s chief architect, who is helping advise on the bid. That means the city is seriously considering locating some of the facilities in south Barcelona to take advantage of the biomass and cooling facilities, Mr. Guallart said. “Whatever we do, we will have the goal of offering a zero-emissions Olympics,” he said.